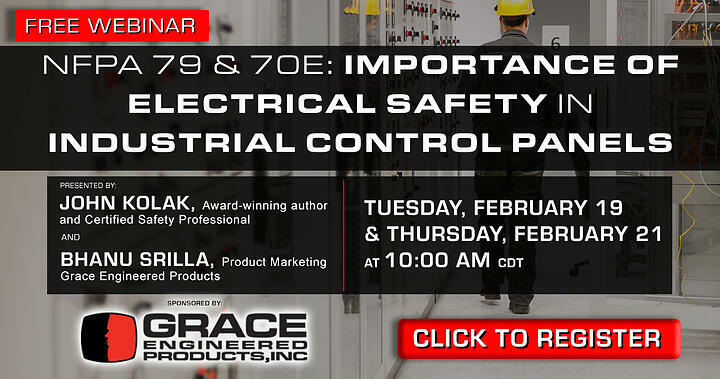 Registration is now open for our free February Electrical Safety Webinar, "NFPA 79 & 70E: Importance of Electrical Safety in Industrial Control Panels". There will be two sessions hosted on Tuesday, February 19 & Thursday, February 21 at 10:00-11:00 AM (CDT). Upon request, the webinar will provide attendees with a certificate of completion for 0.1 CEU. All registrants will receive a follow-up email after the presentation with a link to an on-demand video version of the webinar as well as downloadable slides. We hope to see you there!